Make homemade pizza that exceeds your wildest expectations—yet couldn’t be simpler—with Jim Lahey’s groundbreaking no-knead dough and inventive toppings. Jim Lahey, the baking genius behind New York City’s celebrated Sullivan Street Bakery and Co. pizza restaurant, has developed a brilliant recipe that requires no kneading and produces an irresistible crust in any home oven—gas or electric—in fewer than five minutes. The secret to incredible pizza is a superb crust—one that is crisp yet chewy, and slightly charred around the edges. My Pizza shares this revolutionary technique and the creative pies that put Co. on the map, as well as recipes for salads, soups, and desserts to make a meal complete. 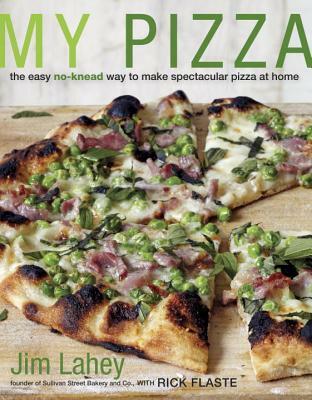 The pizzas in this book aren’t your usual, run-of-the-mill pies. In fact, Jim’s unique topping pairings—such as Corn and Tomato, Coppa and Fennel, and Potato and Leek—reinvigorate this American favorite. His whimsy is apparent in his Pepperoni Pie, which doesn’t include the cured meat we have all come to expect; instead, riffing on “pepperoni” as the Italian plural for “pepper,” Jim offers a pie with red pepper puree, ground lamb, and pecorino cheese. To round out dinner, My Pizza also has recipes for starters and side salads—such as Cannellini Bean Toast, Pea Soup, and Bibb and Roasted Squash Salad—and sweet finishes, from Milk Chocolate Sundae to Banoffee Pie. With gorgeous color photographs and helpful tips on equipment and techniques, My Pizza unlocks the secrets of great, easy pizza for home cooks everywhere. Jim Lahey opened the Sullivan Street Bakery in 1994, and Co., a pizza restaurant, in 2009 in New York City. Lahey and his businesses have been featured in Vogue, Saveur, and the New York Times, and he has appeared on the Martha Stewart Show and NBC’s Today show. His innovative no-knead bread recipe, first published in an article by Mark Bittman in the New York Times in 2006, became the basis of Lahey’s cookbook My Bread, which was a Gourmet Cookbook Club selection. In 2015, Lahey became the first recipient of the James Beard Award for Outstanding Baker. Jim Lahey studied sculpture before learning the art of bread baking in Italy. Rick Flaste, the first editor of the Dining Section of the New York Times, has collaborated on several books.